The main reason why i still use Variants is that are from the days before Rotring began using the DinA4 scale for all of their pens. The “Deutsche Industrie Norm” dictated pens to have widths as 0.13 and 0.18 mm, while before that it was simply 0.1mm, 02 mm, etcetera. A few years ago pens with these widths were taken in production too again, but that was too late for me. 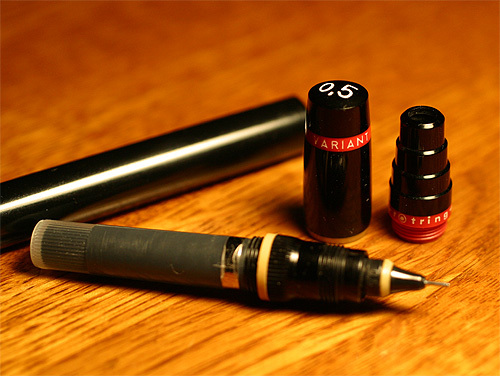 Because i used these pens for comic lettering, especially the 0.3 mm was essential. And suddenly all i could buy were 0.25 and 0.35 mm pens! I bought all pens that i managed to find in the Benelux and i think i have enough for the rest of my life. But i did not buy much 0.5 mm Variants. Recently i discovered that i have only one left. In the package that Eiko sent me were three 05mm pens: one Variant (!!! ), one Micronorm (also taken out of production long time ago, and the second best pen after the Variant), and one pen of a brand called Stano. I have never seen this branche, but i have seen several other Rotring imitations like these. I have quite a collection of this stuff and i will gladly write about this in the near future. But tonight i am going to test all of the pens that Eiko sent me. 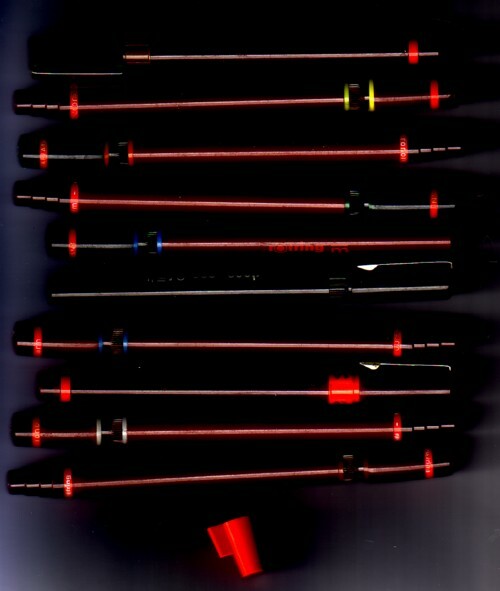 As you can see on the price tag, the head of these pens costed 23.60 guilders back in the mid-eighties. I used the Variant pens not only for lettering, but also for drawing and writing. But since a few years i started to use all kind of writing utensils for drawing and writing, usually the pen that is most close by. But for lettering i still only use Rotring pens. With two and a half half new 0.5 mm Variants the end of my lettering carreer is postponed at least another year, thanks to Eiko. Hello! how do you clean Rotring Variant? @vero: i take the head carefully apart and then clean all the parts with paper tissues and warm water. just bought 30+ variants, isographs, varioscript (?) on a market for €4. Still gloating, love the Rotring. Seems to be lot surfacing on the 2nd hand market in UK. Hello guys…good day I have Rotring Variant Tech Pen Set with the original box.I think this is a vintage pens. I found it from our storage 30-20 years seating there till I found it totally kept secured on a bag with an Engineering stuffs…this 2015. I found it from our storage 30-20 years seating there till I found it totally kept secured on a bag with an Engineering stuffs…this 2015. I’m trying to sell it. I have a 0.5 Rotring Variant, but the plastic cartridge that holds the ink has cracked. Is it possible to use a rapidograph cartridge as a replacement? If not, what should I do?! Thanks.